Customize the WordPress shortlink structure to your needs. Another WordPress plugin of mine just got approved by the WordPress.org team. 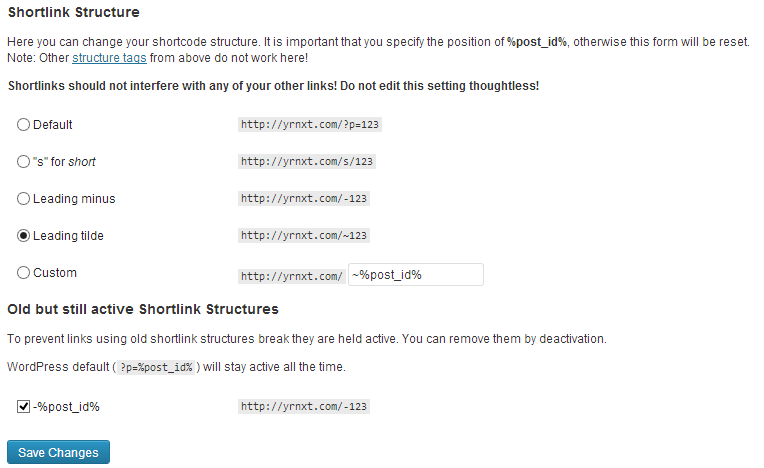 Custom Shortlink Structure enables you to specify your own style for your WordPress blog’s shortlinks. By default these shorlinks look like http://yrnxt.com/?p=153, for this blog I now changed them to http://yrnxt.com/~153. This might be a small change, but then, for some the small things might matter at last. The second category, old but still active shortlink structures, is only displayed when you changed the shortlink structure a second time. Through not disabling old rewrite rules directly the plugin ensures that no hyperlinks to your site break. If you still want to kill those rules: Uncheck them. Go get the plugin at the WordPress plugin repository or at GitHub.